Ceres is the closest dwarf planet to the Sun and is located in the asteroid belt, between Mars and Jupiter, making it the only dwarf planet in the inner solar system. 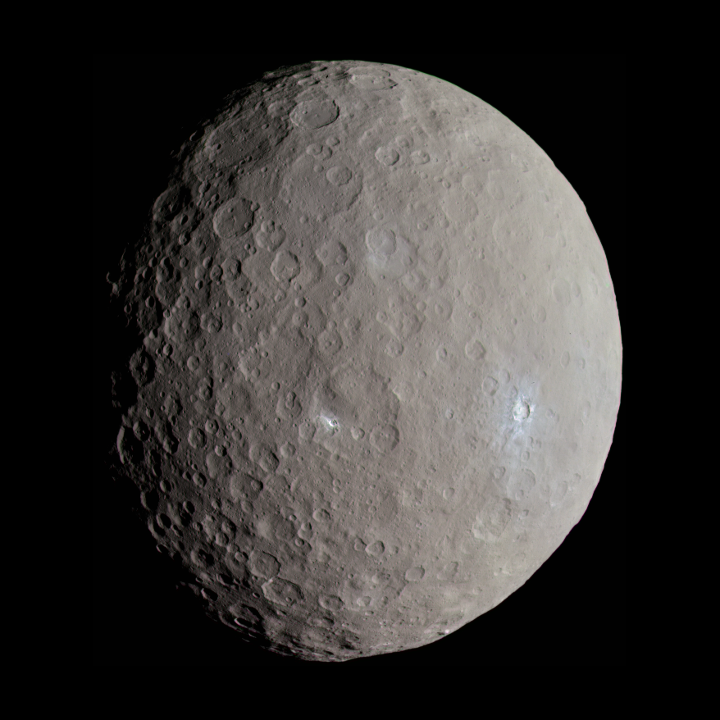 Ceres is the smallest of the bodies current classified as dwarf planets with a diameter of 950km. Ceres was the first object considered to be an asteroid. Italian astronomer Giuseppe Piazzi discovered and named Ceres in early 1801. The first visit to Ceres is due in 2015. NASA’s Dawn spacecraft has been making its way to Ceres from the asteroid Vesta since September 2012. There is high interest in this mission since Ceres will be the first Dwarf Planet visited by a spacecraft and is one possible destination for human colonisation given its abundance of ice, water, and minerals. Ceres has a mysterious white spot. This can be seen in both the old Hubble images and the more recent photos taken by the Dawn spacecraft on its approach. Every second Ceres loses 6kg of its mass in steam. Plumes of water vapour shooting up from Ceres’ surface were observed by the Herschel Space Telescope this was the first definitive observation of water vapour in the asteroid belt. It’s thought this is caused when portions of Ceres’ icy surface warm. Ceres accounts for one third of the mass in the asteroid belt. Despite this it is still the smallest and least massive of the dwarf planets. For roughly the first 50 years after its discovery Ceres was frequently referred to as a planet. By the end of 1851 14 other similar objects had been discovered and it did not take long before these instead became known as “minor planets”. Ceres was eventually reclassified as a Dwarf Planet alongside Pluto in 2006. Ceres is the only dwarf planet with no moons. The other dwarf planets; Pluto, Haumea, Makemake and Eris all have at least one moon.